What's it like to travel around the world by sailboat? What’s It Like to Sail Around the World? 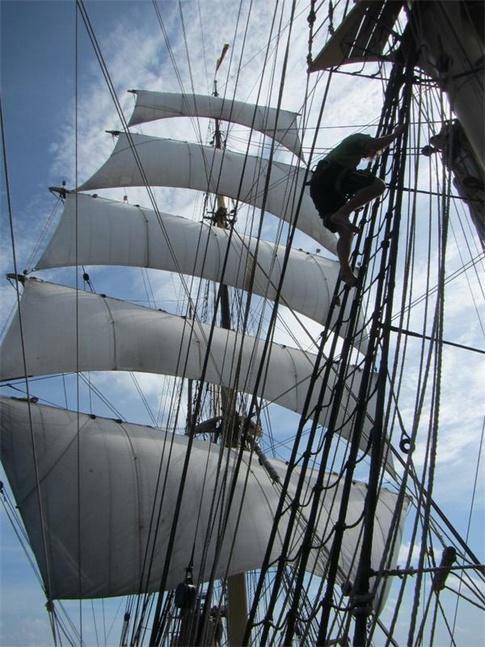 I sail as a purser aboard Barque Picton Castle, a traditional square-rigged sail training ship best known for her global circumnavigations; it takes us about year to sail around the world. And what better way to spend a year? Trainees don’t need any sailing experience to apply—they just have to be ready for the physical and social demands of living and working in a small ship crossing big oceans. It’s hard work and not for the faint of heart or self-important. In the words of Richard Henry Dana in Two Years Before the Mast, “The beautiful is linked with the revolting, the sublime with the commonplace, and the solemn with the ludicrous.” But the beauty truly is incredible, and I’ve never met a sailor who didn’t have a sense of the sublime. Finally, morning comes. The dark gradually becomes less dense until the first gleams of light rise above the horizon. The pinks and gold that glow across the sky are as awe-inspiring as any cathedral. Take a minute to look around, to breath the salt air, and feel the sense of wonder and contentment. And then sun’s up and it’s time for deck wash, fresh water rinse, hands to braces, trim the yards, tidy the scullery, set up for breakfast, wake the watch below, final ship check. All’s well. And the 4-8 watch are mustered and stood down, with eight hours to snooze, chat, study, play guitar, and generally do as they please before mustering again for their evening watch. The islands and ports we visit are incredible in their diversity. We call at some of the most beautiful, interesting, and remote places on the planet, and the welcome and generosity we receive from the local people all around the world is consistently astonishing. From the mythical islands of the Galapagos and the laid-back gorgeousness of Aitutaki to the chic and bustling international hub that is Cape Town, we really do call at some of the best places in the world. But for me, life is just better at sea. What films make the best use of a ship and why? When people are sailing around the world, what do they do at night? What figures of speech or idioms come from sailing, and what do they mean?